Fashion is evolving, right? This blog helps me step out of my comfort zone and try new things. I saw this similar jacket (outfit #3) on Chloe a few months ago and loved the look! Beforehand, I would not have walked into Forever 21 and thought, "Wow, this jacket is awesome!" Nope, I would've thought, "That looks like a jailbird coat." I showed this jacket to David who said, "That's not your style," to which I thought: exactly, a new challenge! LOL at jailbird! You look great and I love the beautiful colors you wore underneath. Pretty! Love all of these bright colors together! 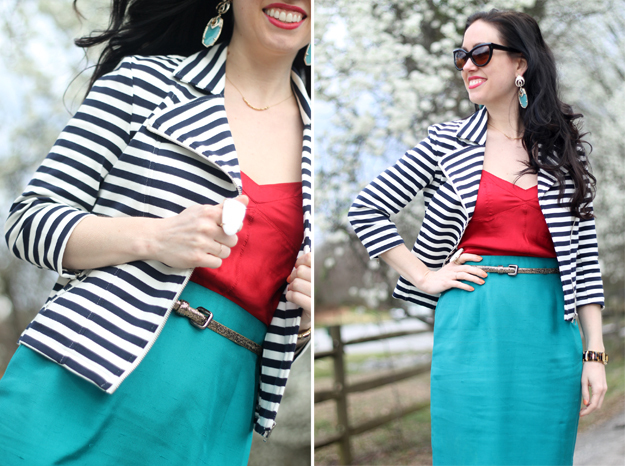 The striped jacket brings it all together nicely! Would love for you to checkout my latest posts and participate in my giveaway!! Follow me, I follow you?! 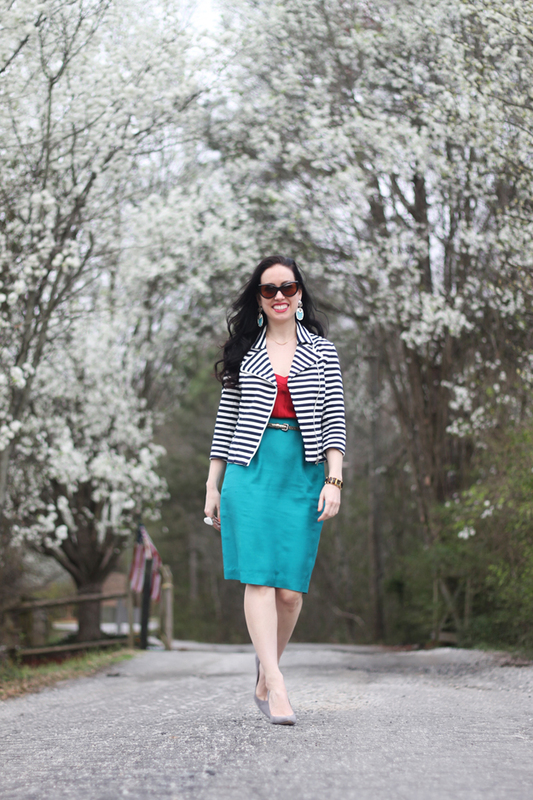 Love this look- color blocking with stripes! So fab!! I love this! It looks so fun with the stripes and color. Love the jewelry choices. LOVING this color combo! Spectacular!!! these colors look amazing together!! you look great! love this color combo together!! I think this outfit looks fantastic together! I like the striped moto jacket, it's very different, and it looks awesome on you! Ha! I love that your first though would have been "jailbird." And I'm right there with you in feeling that fashion is truly evolving and that blogging helps with enjoying the ride! It's all about stepping outside your comfort zone and taking risks...and I think you did it beautifully here Mary Ann! Oh, and you wear Kendra Scott earrings better than any blogger I know! Thanks for the shout-out! The jacket looks fab on you and oh, I want to steal your Tom Ford sunnies *so* bad. I'm terrified the Anouks will be too narrow and squeeze the holy bejeezus out of my wide head--do they run narrow? Gorgeous color on the skirt. Love the striped blazer too. supercute! now this is how color blocking is done!! And made that striped blazer work alright! It looks so fresh against the colorblocking you did. Amazing! ohhhhhhhh stripes and red lips!!! it couldn't be better!!!! Please, could you make me a favour?? I would appreciate it a lot! I love your jacket & blouse! I need to get my hands on some cateyes! You look so glam! you have such a lovely blog! can't wait for more posts! super cute outfit! I adore the color combination and the striped jacket. Love this color combo! I've had a striped blazer on my wish list for a while, might have to check out Forever 21 now! Hi beautiful! tnks a lot for ur lovely comment (: I really love ur pictures! Do u want to follow each other?? I love the combination of the colors and the striped print! I'm following you now.